After one abject defeat, and in the middle of a failing war, there has never been a better time for a book on the real problems besetting the British military service, the last institutional sacred cow. Losing Small Wars is a synthesis of personal insight and well-sourced academic reflection with a strong leavening of historical context. The book will be essential reading for anyone wanting to understand the British military in the 21st Century. A powerful critique of British military complacency and arrogance, Losing Small Wars will reshape attitudes to ‘the Best Counterinsurgency Army in the World’. Losing Small Wars is no hatchet job, the book is written from the perspective of a retired officer who loves his country and service, but believes the time has come for the British military publicly to answer some tough questions; chief amongst them ‘Why has the British military machine so conspicuously failed in fighting its recent wars? It is written from a steady, respectful but critical perspective. Ranging from a critique of supposed successes to a look at how the UK compares to the highly competent militaries, Losing Small Wars will suggest a way ahead in a world where 'wars amongst the people' demand skills and qualities the UK military badly needs to develop. 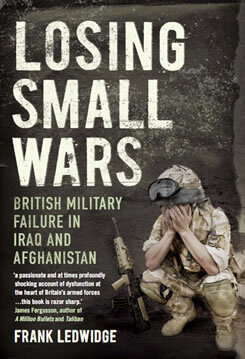 "Losing Small Wars is an excellent book ... It provides a devastating, highly readable critique of why Britain’s armed forces have fared so badly in two of the country’s most recent and controversial conflicts: Iraq and Afghanistan.... what Losing Small Wars does so well is to bring the catalogue of errors to life in graphic detail." " … the author deserves applause for bluntly expressing the truths about our recent military failures that too many of those involved find it convenient to obscure… The author concludes: “We do not currently have armed forces that are equipped for conflicts… where brutally put they are actually invaders in lands far away and of which they know really very little.” I agree. A radical shake-up of the army is needed. It is only because its prestige is so low after defeats in Iraq and Afghanistan – as Ledwidge justly characterises these experiences – that the government can get away with savaging its strength in defence cuts. If much is wrong with today’s British Army, by the time the Cameroons have finished there will be precious little of it left." "…Losing Small Wars, is a savage indictment of the military leadership that got British soldiers into one impossible situation after another in Iraq and Afghanistan." "In many ways this is the sort of book I'd like to have written. Controversial, iconoclastic even, written by an insider, it casts a knowledgeable and critical eye over recent British military operations and doesn't shy away from exposing incompetency and naming the guilty." "If you are interested in the future of the British Army, as well as its past, then buy this book." "He writes with authority – and passion." "Frank Ledwidge’s Losing Small Wars carries a painful message which should be read by any officer who thinks seriously about his or her profession…As a first draft of the history of these campaigns, this is a very good start. I believe it should be essential reading for all JSCSC students and I unhesitatingly recommend it." "...a passionate and at times profoundly shocking account of dysfunction at the heart of Britain's armed forces... razor sharp." "...carefully researched and full of telling anecdotes, Ledwidge's book may make uncomfortable reading for politicians and some senior military figures." "...one of the most upsetting books I have read about Britain's part in the wars in Iraq and Afghanistan." "But few have the long and diverse experience of the Army in Iraq and Afghanistan that enabled Frank Ledwidge to produce his superb ground-breaking book, Losing Small Wars: British Military Failure in Iraq and Afghanistan. For 15 years he was a naval reserve military intelligence officer before retiring in 2008. 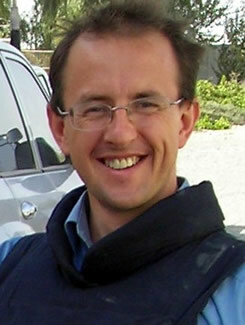 During that time, he was a close observer of how military operations were conceived, carried out and assessed. Such "insider" books can be shrill in tone or overstate their case, but Mr Ledwidge is judicious, sceptical, intelligent and highly informed.... Mr Ledwidge is particularly good at understanding how the very fact of occupation generates political and military antibodies to repel it. " " ...angry, but nonetheless intelligent, well-informed and thought-provoking polemic...this is a very important book that ought to be read by anyone with an interest in defence and foreign interventions – armchair general and operational commander alike."